Bennett Brinson Gamel: Fighting Cystic Fibrosis: My firstborn, I love you. If "a picture is worth a thousand words," this one is worth a whole book. During our recent family photo shoot, Khimberly asked me to put my forehead to Oliver's forehead, to hold is chin with one hand, and to have him put his hands in my other hand. It felt a bit awkward. We were eyeball to eyeball, hand to hand. But I had no idea what amazing shot that would turn out to be. This might be a perfect analogy to my learning how to be a mother to Oliver. At times, it has felt unnatural and yet I can describe it as nothing less than an amazing experience. The last five years have been my learning how to love my son. He was a fussy baby. Even as an infant, he did not like change. He wasn't easy-going. He didn't like to sleep. I was a new mom, living far from family, trying to balance a new baby while working full-time supporting my husband through grad school. I didn't know how to raise a little boy. For some reason, I had expected my firstborn to be a girl. I had to grieve that I would not experience pink hair bows and baby dolls. Instead, I would be trading them for "snips and snails, and puppy dog tails." I was in the middle of that process, understanding what it means to be a mom to boy and learning to appreciate Oliver for who he is, when tragedy struck our family. Oliver's little brother was born gravely ill. The next two years were spent in and out of the hospital and at clinic appointments, grieving Bennett's diagnosis of a terminal disease, and balancing a new little baby whose birth was overshadowed by his illness. Oliver, who never liked change in the first place, struggled to cope. His mom was no longer able to be as emotionally present as she had once been. His dad was preoccupied with supporting his family while also attending to his first year in a Ph.D. program. Bennett's condition screamed for our attention. It was clear Oliver needed extra support. I reached out to a play therapist. Each week, the play therapist would "listen" to Oliver through his play and later explain to me his feelings and needs. It was hard for me to understand how integral I was going to be to helping Oliver. I viewed Oliver's problems adjusting as something separate, something outside of me. What I didn't realize was Oliver's behavior problems and difficulties adjusting were directly related to my own struggles to feel safe during such a difficult time. Oliver felt out of control and misunderstood. At the tender age of two, his world had just been turned upside down. He kept wanting me. But the more he wanted me, the more overwhelmed I felt. And the more overwhelmed I felt, the more distant from him I got. Oliver was feeling abandoned and afraid I did not love him. He may have even picked up on my deep-seated yet unconscious desire for a daughter, my feeling helpless as a mother when it came to raising a little boy. But, ever so slowly, with guidance from Oliver's play therapist and as my own therapist helped me unknot the grief I held deep inside, I began to understand what Oliver needed. He needed me to show him over and over again that I loved him, completely and unconditionally. Children don't understand words, they understand actions. I began to learn specific ways I could demonstrate this love to Oliver. Some ways that felt natural. Other ways that did not. As Bennett's health improved and my stress lessened - as our family life felt less tumultuous and my relationship with my firstborn improved - Oliver felt safe again. Eventually, Oliver's behavior gave way to a childlike happiness and overall peacefulness we had not seen in Oliver for a very long time. 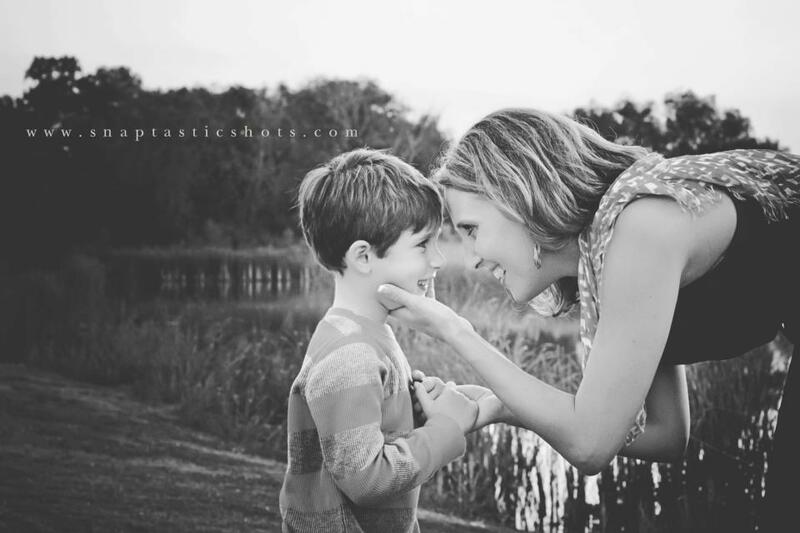 Like the clearing of clouds on a rainy day, slowly, I began to see through the difficult behavior, crying fits and extreme anxiety-filled moments to find my son had an extremely gentle spirit, an inquisitive mind and wonderfully loving demeanor about him. All he wanted was to feel safe, loved and delighted in, from me. And I just didn't know, in my inexperience as a mother, how to give that to him in a way he could understand. What I love about this picture is it tells a story about a mom who is in love with her baby, exactly the way he is. And it is a story about a little boy who now confidently knows he has his mother's heart and her undivided attention at his fingertips. This is beautiful, thank you for sharing, and as always being so honest! I have a mom friend who needs to hear this, can I pass it along? Gorgeous picture and beautiful thoughts! It's been a blessing to watch you both grow. Hi -- I know this post is very old, but it is so beautifully written and I can really identify with it. My twins were only 22 months old when their younger brother was born with a heart condition. While one of them was able to ask for what he needed emotionally, the other was not... and has been anxious and struggling since. I'm particularly interested in when you said, "I began to learn specific ways I could demonstrate this love to Oliver. Some ways that felt natural. Other ways that did not." I would love to know more about what some of these ways are, if you feel you could share that information. I know Oliver has recently been diagnosed with a learning difference and giftedness, and I'm sure it all fits into the picture. My child was tested recently and she is also gifted, but has gaps between her intellectual understanding and her emotional understanding/communication. We are trying to learn better ways to accommodate her feelings. I stumbled across your blog by happy accident. Thanks so much for sharing your conscientious writing and your loving care of your children.